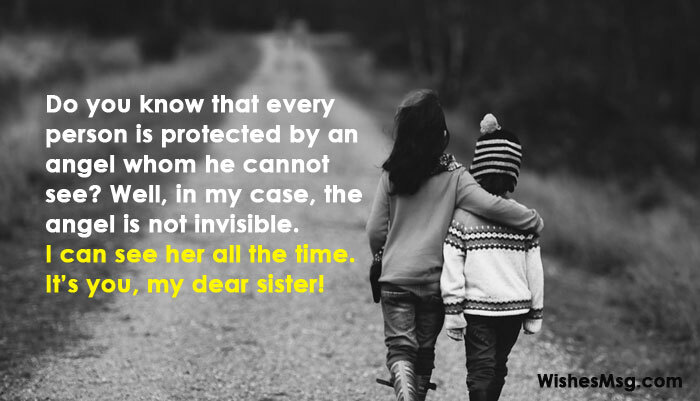 Messages for Sister : Sisters the sweetest gift from God. Brothers and sisters share the sweetest part of their life together that is childhood. There are just too many memories that you cannot forget. A sister can love you unconditionally, be your best friend & be the person whom you can trust with all your life. You may never be able to love them as much as they do, but you can surely make them smile with some quotes or texts. If you are a brother, don’t just take their love for granted. A little love message from you can make them realize that you too love and care for your younger or older sister. Don’t be shy. Make up some love messages for your sister by yourself. Give her some funny text, make your sister laugh. You can also find sister quotes everywhere on the internet. 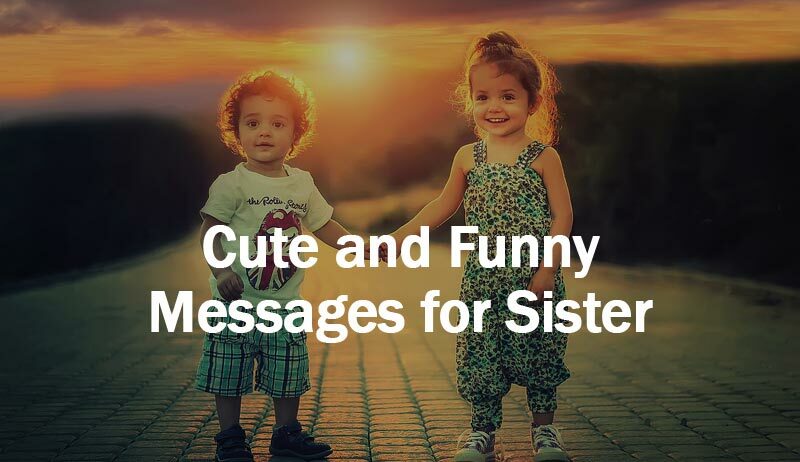 Here, we have love, funny and cute messages for your sister. Do you know that every person is protected by an angel whom he cannot see? Well, in my case, the angel is not invisible. I can see her all the time. It’s you, my dear sister! People say find a friend who can keep your secrets well. But I don’t look for that quality in my friends. Because I already have someone whom I can trust with all my life. Do you want to know who the person is? It’s you! My fiancé wanted to tell me a story of a beautiful angel who had a soft heart & had put up with so much in life but never lost hope. I said, wait, how did you know about my sister? I love you so much dear! Whenever I look at you, I see our mother. Sometimes I become jealous, because you have everything of her. You have the same eyes & same smile. And then I realize how much blessed I am. I have the best mother & the best sister in the world. I love you a lot. No matter how many people I have in my life. Nothing can replace the love I have for you. Not even all of them can make me feel the way I do when I’m with you, my sister. My girlfriend told me I have to buy her make-ups & jewelry so she can look more beautiful in parties. I said, why waste money? I’ll lend you some beauty from my sister. You used to be cute. What happened, dear sister? Look at you. You’re not cute anymore. I’m sorry but now I can’t use the word cute now. I have to say you are gorgeous! Whenever I have tough times in my life, I always ask you for solutions. Do you know why? 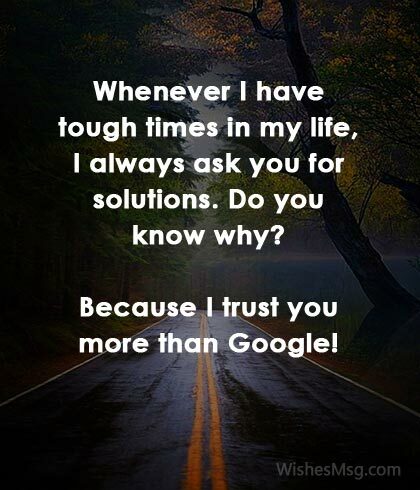 Because I trust you more than Google! Dear sister, I was trying to find a word to describe you. I came up with ‘beautiful’. Then I tried to find a sentence that fully describes you. I came up with “beautiful girls are dumb”. I love you, beautiful sister. I really don’t have any idea how someone so immature, funny & embarrassing could be my sister & best friend. Well, I’ve accepted the fate & you should be thankful. By the way, I love you. All the cuteness in the world doesn’t match the smile you have. I am so happy that I’m your little brother and maybe I’ve got a little bit of that smile too. I love you, dear sister. When you were a baby, I loved to watch your little hands and how you used to hold my fingers with those. You were so cute and fluffy. Look at you now! You are so big and mature. I tell you one thing, I loved you back then when I didn’t know what love was. I love you now & will love you till my last breath. When I’ll become old & I’ll not be able to go for a walk with you. I’ll have trouble hearing & I may not be able to see things clearly. Pictures we took will be of no use then. Do you know how I’ll remember the memories we shared? I’ll just close my eyes and all the cute memories will come alive. I love you! Dear sister, when I become so old that all my teeth are gone, even then I want to sit beside you & listen to your jokes and laugh out like a little baby. How will I look when I’ll smile without teeth? No matter what happens in life, I always want to see you smiling. I’ll do whatever it takes to make you happy. Just like I used to do when you were a baby & I was maybe 3. I love you! !